Fall foliage is heightened in color to a bright apple red. A beautiful focal point or close-up accent for lightly shaded locations. We offer Red Dragon in 10 gallon container. 'Red Select' is a dissected cultivar that typically grows in an upright, broad-rounded but cascading form to 4-6' tall over the first ten years, eventually maturing to 10' tall and to 12' or more wide. It is noted for its lace-like foliage that emerges light red in spring, matures to deep red-purple in summer and finally turns crimson red in fall. 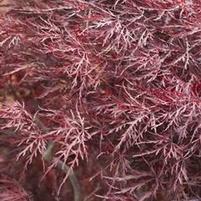 Palmate, 7-lobed, red-purple leaves (to 6" long) are deeply cut and dissected. Foliage tends to leaf out early in spring and is subject to damage from late spring frosts. We offer the 'Red Select' in a 10 gallon container. Bloodgoods have bright red leaves in the spring - maturing to a rich purple-red color during the summer - becoming a bright crimson in the fall. This sturdy, deciduous tree makes an excellent selection for nearly any landscape! A vigorous upright grower that becomes rounded with age. Small inconspicuous red flowers in spring followed by red fruit in early fall. This tree retains its color well even during summer heat. We offer single stem Bloodgood 5' to 6' tall in a 10 gallon container. 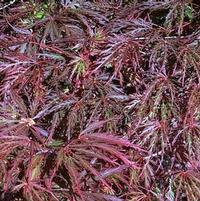 The new growth on this small Japanese Maple is a bright crimson red that persists through the entire growing season. Finely dissected leaves on handsome cascading branches. Ideal for small gardens and tight spaces. Summer color becomes crimson in the fall. We offer Crimson Queen 4' to 4 1/2' tall in a 10 gallon container. A real 'eye pleaser' in any garden, this deciduous vigorous grower offers year-round interest in colorful, finely-dissected leaves and handsome, frosted, red bark. 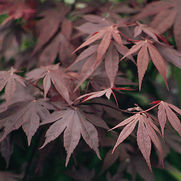 Deep red-purple foliage and weeping cascading branches retains its leaf color even in hot weather. Inconspicuous red flowers and fruit appear in spring and late summer, respectively. Leaves turn a fiery scarlet red in the fall. We offer Tamukeyama 5' tall in a 10 gallon container. Soft salmon peach-pink blooms emerge in abundant small, funnel shaped flowers in mid April to early May. Dark green foliage throughout the summer. This slow growing evergreen azalea stays compact and semi-upright. 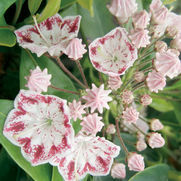 Pleasant to the eye, a great choice for brightening a partly shady patio or courtyard garden. We offer Blaauw's Pink 18" to 24" in a 5 gallon container. Double rose-red blooms cover the shrub in a profusion of color in late spring. 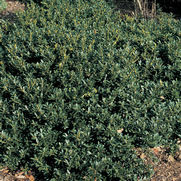 Dense, broadly rounded evergreen shrub with large, glossy green foliage. The leaves take on a Mahogany color in the fall and winter. An excellent choice for a showy border or accent planting. 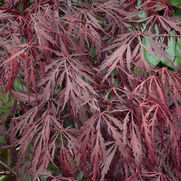 Makes a great companion plant for Japanese Maples. We offer Christina 18" to 24" in a 5 gallon container. 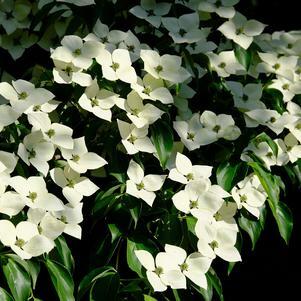 Clusters of outstanding clear white flowers with cream centers emerge among dark green glossy foliage in late spring. This compact, vigorous, grower extends the azalea flowering season. The leaves retain a nice green color into winter. Excellent as a foundation plant, showy accent, or low hedge. We offer Pleasant White 18" to 24" in a 5 gallon container. Brilliant glowing pink flowers in spring. Excellent evergreen shrub with a dense growth habit. Glossy, dark green foliage turns a dark burgundy color in winter. This azalea is valued for its adaptability to colder climates. Outstanding foundation plant or as a medium height hedge. We offer Renee Michelle 18" to 24" in a 5 gallon container. Vivid single orange-red flowers put on a showy display on this dense, rounded evergreen in the spring. The dark green summer foliage becomes a wine red in the winter adding seasonal interest. Makes a classy hedge or specimen plant in any landscape. We offer Stewartstonian 18" to 24" in a 5 gallon container. Coral, orange-red to rose color blossoms cover the entire plant in a dense profusion of color in mid-season. 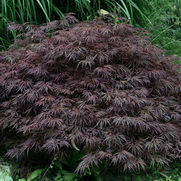 A spreading, semi-dwarf shrub with dark green attractive foliage that becomes burgundy in the fall. Plant as a border or small hedge or single specimen. We offer Fashion 18" to 24" in a 5 gallon container. 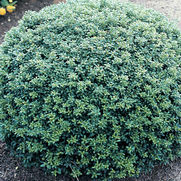 The Winter Gem boxwood is a densely branched upright evergreen that offers a gracious landscaping form. It produces lettuce green spring foliage that turns a deeper green in summer. The tips of the leaves turn a slight bronze color during the winter. Ideal selection for low hedge or shrub border. Responds well to pruning and shearing. A good deer resistant shrub. We offer Winter Gem 12" to 15" in a 3 gallon container. We also offer Winter Gem 18" to 24" in a 7 gallon container. The Green Mountain boxwood forms a perfect wide pyramidal oval. The most upright of the koreana x sempervirens hybrids. Excellent small dark green leaves maintain their color in winter. Excellent for accent planting, single specimen or hedging. We offer Green Mountain 12" to 15" in a 3 gallon container. 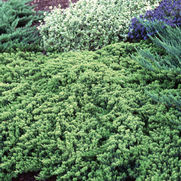 Green Velvet is a rounded, full-bodied, slow growing boxwood. It's easy to see how the name for this charming boxwood cultivar came to be. In the spring when the soft, bright green new growth emerges it has a rich velvet appearance. Known to hold its lovely green color through the winter months. A great plant for defining boundaries or using in mixed borders. We offer Green Velvet 12" to 15" in a 3 gallon container. Round and compact form, this hybrid offers lustrous dark green leathery leaves along purplish stem. Needs little or no pruning makes it a virtually maintenance free shrub. Used as foundation, borders and hedge planting. We offer Bennett's Compacta 18" to 24" in a 5 gallon container. 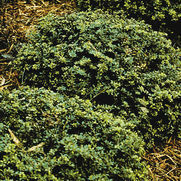 A low growing handsome shrub with dark green lustrous foliage. The growth habit is dense and mounding with a wider spread. The Green Lustre is hardier than many Japanese hollies. Small flowers are inconspicuous followed by black fruit in winter. A great shrub for foundation planting a small hedge or mass planting. We offer Green Lustre 18" to 24" in a 5 gallon container. 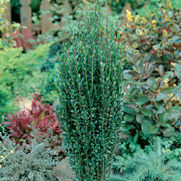 Lustrous dark green leaves on this upright densely branched form give it a pleasant formal appearance in the garden. Small white flowers in spring followed by black fruit in fall and winter. Excellent for smaller spaces, narrow hedge or as container specimen. We offer the Sky Pencil 18" to 24" in a 5 gallon container. We also offer the Sky Pencil 3' to 4' in a 7 gallon container. A vigorous, upright pyramidal shrub with lustrous dark green, flat leaves. Does well in full sun or partial shade. Needs winter protection in colder climates. Excellent as an accent, single specimen or used as a medium height hedge. We offer the Steeds 30" to 36" in a 7 gallon container. 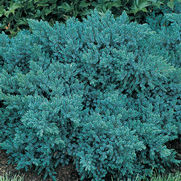 Low growing and trailing habit this juniper sports ocean blue-green foliage that keeps its color well in colder weather. Drought, heat, and cold tolerant once established in the landscape. Adaptable to a wide range of soil conditions. Used as foundation planting, around taller shrubs or trees, hillside groundcover and seashore. We offer the Blue Pacific 15" to 18" in a 3 gallon container. Very flat growing form with trailing silver-blue branches that take on a light purplish color in winter. Drought, heat, and cold tolerant once established in the landscape. Very adaptable to a wide range of soil conditions. Used to cover vast areas, trail walls and cover hill sides. Great plant for controlling erosion. We offer Blue Rug 15" to 18" in a 3 gallon container. Nice blue tinted foliage on this dense, low growing rounded evergreen. This juniper is slow growing and does not develop a central leader thus keeping it nice and dense. Adapts to a wide variety of soil conditions. We offer Blue Star 12" to 15" in a 3 gallon container. 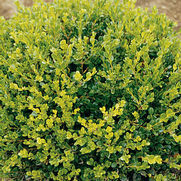 Dense rounded shrub with glossy dark green foliage that is year round. Elegant red flower blooms around May making it a considerable spring display. Ideally suited as a landscape accent, informal hedge or mass planting. We offer Forever Red 18" to 24" in a 5 gallon container. 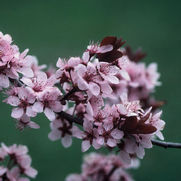 Beautiful blooms appear late spring to early summer including colors of burgundy, purple, red, and white. Overall display is supported by blueish/green to reddish/bronze foliage colors. This shrub is compacted with a mounding shape. Ideally suited as a landscape accent, informal hedge or bordering. We offer Keepsake 18" to 24" in a 5 gallon container. Lavender buds open to reveal an intricate cinnamon-purplish band around the edge of the white flower in mid spring. Broad colorful new foliage becomes a glossy dark green in summer. Ideally suited as a landscape accent, informal hedge or border. We offer Carousel 18" to 24" in a 5 gallon container. Compact grower with broad, glossy dark green foliage. Burgundy-red flower buds open to a very deep raspberry pink, this selection is notable as the reddish flower color develops well even in shade. Ideally suited as a landscape accent, informal hedge or mass planting. We offer Raspberry Glow 18" to 24" in a 5 gallon container. 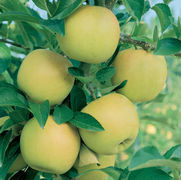 This compact semi-dwarf tree offers four popular apple varieties grafted into its branches. By grafting companions that bloom at the same time, two early and two later, it eliminates the need for a second tree as a pollinator. This tree is great for smaller yards and tight spaces. 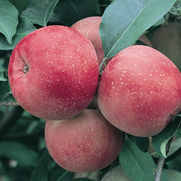 This variety can produce bushels of apples for you to enjoy from just one small tree. We offer '4 in 1 Combo' in a 15 gallon container. We also offer '3 in 1 Combo' in a 15 gallon container. White buds open to white flowers in mid April followed by medium sized reddish-green fruit in late September and October. Crunchy and full of flavor, the Fuji has become one of American's favorite eating apples since it was introduced in the 1960s. Pollinates well with Granny Smith or Yellow Delicious. We offer Fuji 1"+ caliper in a 15 gallon container. Light pink buds open to pink and white blooms in April. 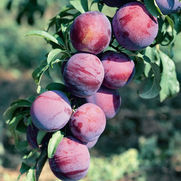 Beginning in August nice crisp, firm and sweet fruit begin to ripen and continues through the fall. One of the country’s most popular apples. Fruit can be stored for up to 6 months. Very adaptable and easy to grow, maintains its oval shape as it matures. A very reliable pollinizer for other apples blooming at the same time. Pollinates with Yellow Delicious. We offer Gala 1"+ caliper in a 15 gallon container. 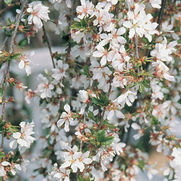 Pinkish-white blooms in the spring followed by large bright green apples in August and September. The fruit is firm with a sweet/tart flavor. Eaten fresh though a bit tangy, this apple is best known for baking, canning and sauces. Full sun exposure, does very well in both hot and cold climates. A good pollinator for other apples blooming at the same time. Pollinates with Yellow Delicious. 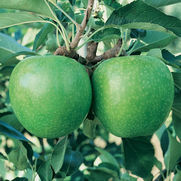 We offer Granny Smith 1"+ caliper in a 15 gallon container. A semi-dwarf variety that produces crisp, red, slightly tart fruit that ripens in August. Good for eating fresh and baking. Prefers moist conditions. Pollinate with red or yellow delicious apple. We offer Jonathan 1"+ caliper in a 15 gallon container. yellowish flesh cover with a deep red skin. It is a good all purpose apple and has great keeping qualities. 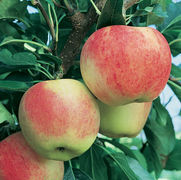 We offer Winesap 1" caliper plus in a 15 gallon container. 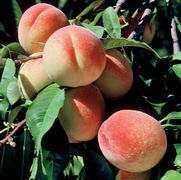 Pink buds open to white flowers in the spring and by September and October the golden yellow skin fruit begins to ripen. Sweet, full of flavor eaten fresh and in desserts. Excellent pollinator for other apples trees blooming at the same time. We offer Yellow Delicious 1"+ caliper in a 15 gallon container. 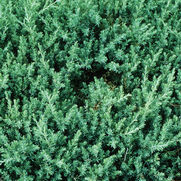 A sturdy, vigorous growing, upright multi-stemmed evergreen shrub. Hues of yellow, red and purple on new growth turns a blue-green as it matures. 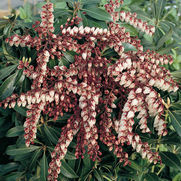 White flowers in summer give way to bright red clusters of berries in the fall that presist into winter. Foliage becomes a crimson red during the winter. Used as a screen, hedge or single specimen. We offer Nandina domestica 18" to 24" in a 5 gallon container. We also offer the domestica 3' to 4' in a 10 gallon container. 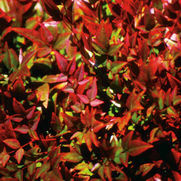 Popular selection of dwarf Nandina for its large colorful leaves. While green underneath in the spring, the new growth emerges light green to pink becoming red during the summer, before changing to a vivid red in the winter. This vigorous grower stays compact and mounding. Use for foundation, border and mass plantings. A great accent plant. We offer Firepower 15" in a 3 gallon container. This dwarf shrub has all the same characteristics as the Nandina domestica. Metallic blue green color in the summer turning different shades of orange or red in the fall. Excellent for foundation or group planting. We offer Gulfstream 12" to 15" in a 3 and 5 gallon container. 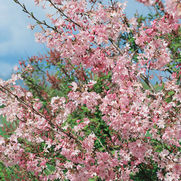 This compact semi-dwarf tree offers four popular Cherry varieties grafted into its branches. By grafting companions that bloom at the same time two early and two blooming later it eliminates the need for a second tree as a pollinator. Great for smaller yards and tight spaces. Some gardeners even grow them in large pots. Bred to be prolific fruiters...you will enjoy an abundance of sweet delicious cherries from even a small tree. 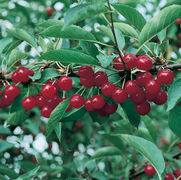 We offer the '4 in 1 Combo' Cherry in a 15 gallon container. This semi-dwarf tree has very dark purplish-red medium sized fruit that ripens early in the season. The flesh of the fruit is tender, very juicy and sweet. Pollinates with Lapins or Bing. We offer Black Tartarian 1"+ caliper in a 15 gallon container. The most popular cherry for making cherry pies. Blooms in early May and ripens in early July with an abundant bounty of fruit. Full sun, adapts to a variety of soil types. 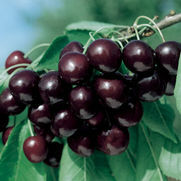 The tree is self-fertile and produces large sized, dark red cherries with a good tangy flavor. We offer Montmorency 1"+ caliper in a 15 gallon container. The Otto Luyken laurel is a densely compact evergreen shrub and a favorite for foundation planting, low growing hedges or mass planting. Virtually maintenance free and hardy can withstand cold, heat and humidity. Tiny fragrant white flowers emerge the middle of spring covering the dark green glossy foliage followed by black fruit in the fall. We offer Otto Luyken 18" to 24" in a 6 gallon container. Clusters of white fragrant flowers emerge in spring against dark green foliage. Flowers give way to black fruit in late summer and fall. One of the best cold hardy forms, tolerates shade and salt. We offer Schipkaensis 24" plus in a 6 gallon container. A Japanese variety with nice dark red fruit from July to mid-August. The flesh is firm and dark red, juicy and sweet. Excellent for fresh eating, cooking, canning or preserves. Pollinates with Burbank. We offer Satsuma 1"+ caliper in a 15 gallon container. 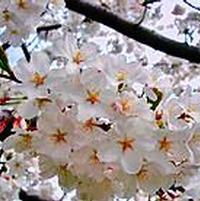 One of the most popular flowering cherries. 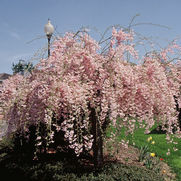 Small upright vase-shaped to round tree, has double clusters of pink flowers emerging in early spring and lasting for up to 3 weeks. New foliage is copper red turning to green in summer with orange-red fall color. Use as single specimen or grouping for a splended display in spring. 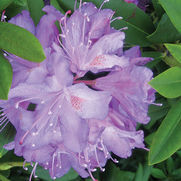 We offer Kwanzan 1" to 1 1/2" caliper, 6' tall in a 15 gallon container. 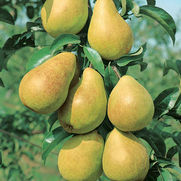 Semi-dwarf variety that produces large greenish-yellow fruit with sweet, juicy, white flesh. Good for fresh eating or for cooking. Blooms in mid-April and ripen in September. Pollinator with Luscious. We offer D'Anjou 1"+ caliper in a 15 gallon container. Semi-dwarf variety produce small to medium size yellow fruit with a red blush. Flesh is sweet and very juicy, a good dessert pear. Blooms in May and ripens in September. Pollinates with D’Anjou. We offer Luscious 1"+ caliper in a 15 gallon container. White flowers with yellow dorsal blotches on dome shaped flower trusses. The broad dense plant is easy to grow and has attractive narrow foliage. Ideal for foundation planting, natural settings, hedges or as a single specimen. We offer Chionoides 18" to 24" in a 5 gallon container. Vigorous, compact, upright plant with light lavender-rose blooms, brown blotches on the dorsal petal. 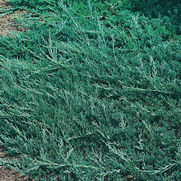 Large foliage, good growing habit and performs reliably in blazing sun and high humidity. Ideal used as foundation, hedge or mass planting. Blooms in May. We offer English Roseum 18" to 24" in a 5 gallon container. A favorite among the Rhododendron varieties. Lilac pink blooms in late May with olive green foliage. A vigorous upright spreading shrub prefers partial shade and well-drained soil. Use as a specimen, or as an accent in borders. We offer Roseum Elegans 18" to 24" in a 5 gallon container. A vigorous growing evergreen with deep green foliage and long lasting lilac flower and yellow-red blotches. Blooms in late May. Thrives in moist, well drained acidic soil. Ideal in mass planting, natural settings and foundation planting. We offer Grandiflorum 18" to 24" in a 5 gallon container. Nice glossy green foliage is the backdrop for deep purple tight trusses of flowers with crimson-violet blotches. Dense and upright this Rhododendron tolerates full sun well but should be protected in hotter climates. 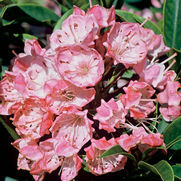 One of the best rhododendrons varieties available. Thrives in moist, well drained acidic soil. Ideal for borders, natural settings or as a single specimen. We offer Anah Kruschke 18" to 24" in a 5 gallon container. This vigorous grower, brings forth perfectly white bell shaped flowers in the spring. Abundant large light blue, sweet and firm fruit in mid July to early August. 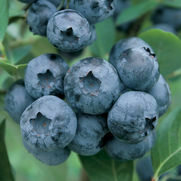 This is the leading commercial blueberry variety in North America. Good eaten fresh, cooking, jellies and jams and freezing. More drought resistant and cold-hardy than most other varieties. Dark green leaves turn a bright red in the fall followed by bright red stems in the winter. 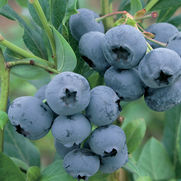 We offer Bluecrop 24"+ in a 5 gallon container. Blueberries have amazing health benefits. Packed with vitamins A and C, potassium, phosphorus, and just 80 calories with 4 grams of fiber per cup. This is the perfect snack. Elliott is a late ripening cultivar. Fruit stores well. We offer Elliott 24" plus in a 5 gallon container. The Chandler ripens mid-July to late August and continues for up to six weeks providing an abundance of large delicious flavored fruit. Good eaten fresh but is mainly used for cooking and freezing. The bush is vigorous with large, dark green foliage and a slightly spreading habit. Fall color is orange-red with red winter stems. We offer Chandler 24"+ in a 5 gallon container. 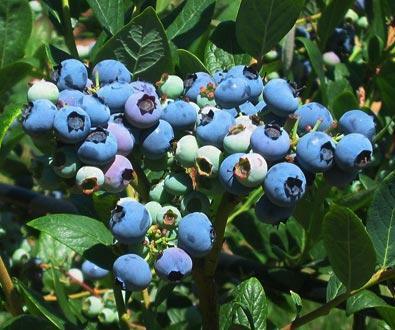 Blueberry ‘Duke’ has medium to large light blue berries with a mildly sweet flavor is quite firm and retains its fresh quality longer than most berries. Duke blooms late but produces fruit in early July. 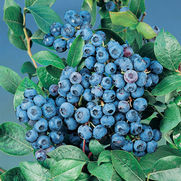 The berries can be eaten fresh, good for cooking and freezing. This upright grower is one of the heaviest, most consistent producers. Fall color is yellow-orange. We offer Duke 24"+ in a 5 gallon container.